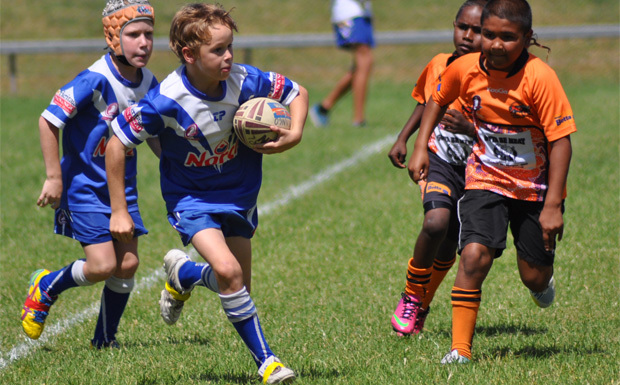 The best young rugby league players in the Wide Bay area turned out in Kingaroy on Sunday to play two representative games in front of a good crowd at TJ O’Neill Oval. 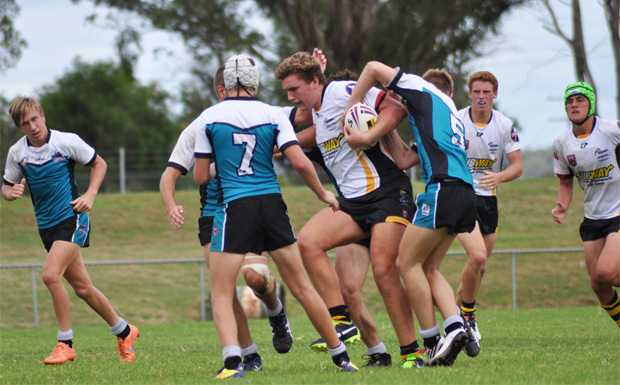 Central United, which includes players from the South and Central Burnett areas, faced the Sunshine Coast Falcons in both U16s and U18s matches. Spectators enjoyed a spectacle of free-flowing football in both grades. 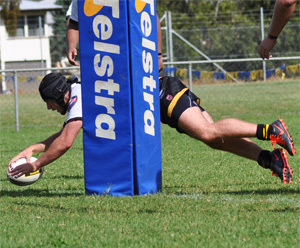 In the U18s Mal Meninga Cup game, Sam Burns opened the scoring for Central United with a spectacular – and lucky – try after the ball was forced loose from a tackle over the line. Burns snatched the ball from the air and grounded it at the feet of the ref to be awarded the try. Central scored twice more in the next two minutes, first with a runaway try under the goalposts by Jarrod Crook, followed by an entertaining try by Michael Cochrane. With Kyle Laybutt’s boot on target, Central United was now leading 18-0 with 18 minutes left in the first half. CU scored twice more (tries to Emmanuel Kiddie and Laybutt) and the scoreboard had blown out to 30-0 before Sunshine Coast put its first points on the board after several attacking moves on the CU tryline. Strong Central defence kept them out twice but it was third time lucky when Lachlan Price went over to score. The conversion by Devlin Long was good, which took the score to 30-6. Three minutes later, the Falcons were back down at Central United’s line with Jamie Casey crossing. Long again converted and the half-time score was 30-12. The Falcons resumed their pressure after the break, with Casey crossing for his second try just four minutes into the half. Long’s kick was successful and the score was starting to look more respectable at 30-18. But five minutes later, CU bit back with James Brown crossing. The Falcons attempted to reply but were held up over the line after taking a quick penalty tap, and then held up again. They continued to test the Central defence but couldn’t convert the pressure into points, using up their six tackles and being forced into a handover. Another Falcons’ mistake a few minutes later – losing the ball in a bone-jarring tackle – gave Central United a scrum win which Michael Cochrane took full advantage of to run the length of the field and score. CU followed up quickly with two more tries, to James Brown (converted by fullback and Kingaroy player Marcus Jensen) and Barry Kalepo. The Kalepo try followed a huge run by Jarrod Crook which brought the crowd to its feet. Crook gathered the ball behind his tryline and sped down the sideline before throwing a massive dummy that the Falcons’ chasers fell for. Crook then calmly passed to Kalepo to score. Jon Simms’ kick was good and the score was now 50-18. The last 10 minutes of the game belonged to the Sunshine Coast but it was all too late. Bryson Mahon and Devlin Long both scored for the Falcons, and Long converted both tries, taking the score at full-time to 50-30. It was a day for the goal kickers with both Kyle Laybutt (CU) and Devlin Long (Sunshine Coast) finishing with five goals and a try apiece. 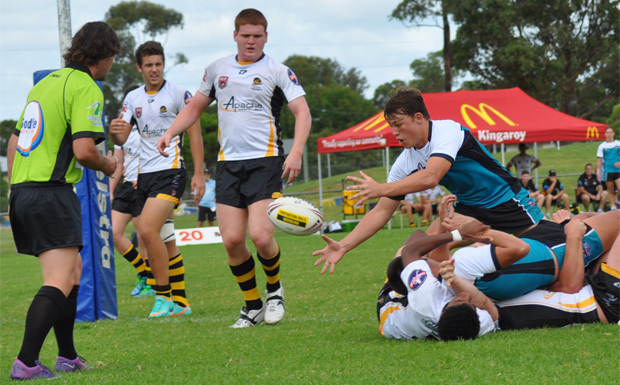 In the U16s Cyril Connell Cup match, the Sunshine Coast Falcons defeated Central United 20-12. Connor Cox, Brody Riseborough, Cory Parker and Tim Venning scored tries for the Falcons and Venning kicked two goals. Jesse Marschke and Jack Just scored for Central United and Hayden Herbert kicked two goals. From Sunshine Coast: Connor Cox, Dale Maddern, Brody Riseborough, Tim Venning. Dean Sahlquist, Blake Bella, Syd McCullagh, Kelvin Bambling, Jake Christinson, Cory Parker, Tom Rafter, Luke Fleming and Joe Curran. The final 18 players to represent Wide Bay at the Titles will be finalised at the last training session. NB. The players for the U13s, U14s and U16s Wide Bay squads will be decided after the 47th Battalion matches played in May. 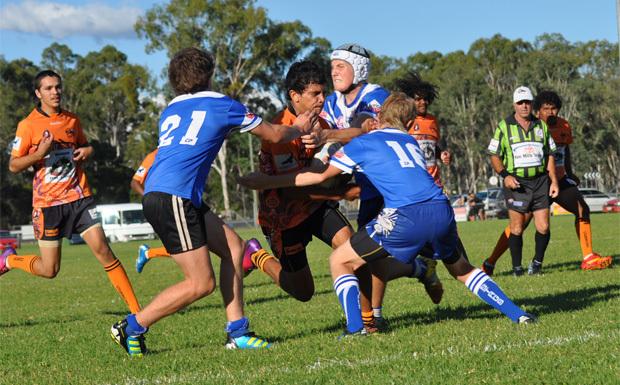 Kingaroy were dominant in their U16s match against Murgon. A full round of junior matches between the Kingaroy Red Ants and the Murgon Mustangs was also played in Kingaroy on Sunday. 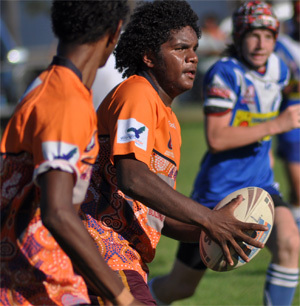 In the U14s match, young Mustangs Barry Tapau and Peter Langton both scored hat-tricks in Murgon’s 36-20 victory. Tapau then backed up in the U16s game against Kingaroy to score two more tries with Jordan Lynas also getting a hat-trick. The Mustangs were defeated in this game, 48-30. In the U16s match, played after the two rep games, the Red Ants were dominant, defeating Murgon 48-30. Kingaroy’s Jye Hopkins backed up for duty for the Red Ants after playing for Central United in the Cyril Connell Cup match. 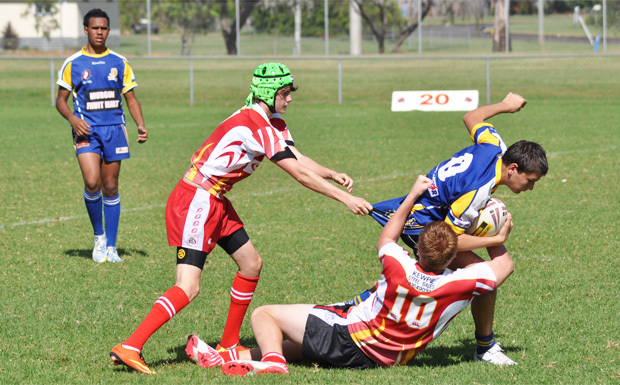 The Nanango Stags were too strong for their Cherbourg opposition in their U16s match played on Saturday in Nanango. In a tough match played in hot conditions in front of a vocal crowd, Nanango came out ahead 48-16 in a bruising encounter. For the Stags, Jeremy Ehrlich continued his strong form from last season, scoring two tries and kicking four goals. Other tries were scored by Dexter Calvert (2), Jack Warden (2), Braedon McKee, Sam Grieve and Tom Batt. Alyse Simpson kicked two goals. For the Hornets, Arthur Bond and Steven Langton both scored doubles. The other try was scored by Erwyn Fisher. 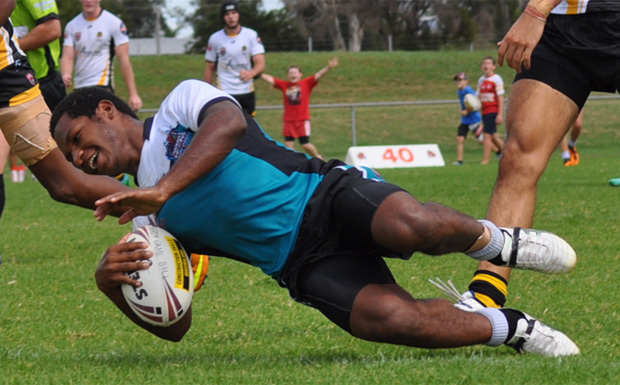 In the U14s, Arthur Carlo starred for the Hornets, scoring an amazing six tries, but his effort wasn’t enough. The Stags eventually came out on top 34-30. Tino Johnson scored a hat-trick for Nanango.